We sell saguaro cacti, ranging from seedlings and juveniles up to mature plants requiring a large trailer with specialized hydraulic equipment to transplant. Most plants smaller than 3 feet tall can be shipped, and anything larger needs to be delivered or picked up. The plants under 3 feet tall were nursery-grown, starting circa 1981, making them about 30 years old. Being nursery-grown means that the plants are larger than average for their height, especially the ones in the wild that must endure desert heat and drought while running a gauntlet of predatory insects and rodents for years on end prior to reaching this size. The spines are dense and long, and the body of the plant is heavier and thicker than the norm for wild ones of similar stature. Saguaros larger than 3 feet tall are generally wild-salvaged, or originate from cultivated landscapes from owners who no longer want them or are unable to keep them for some reason. Plants from 3 to 7 feet tall can still be moved by hand, although they are far too weighty to ship. Ones taller than 8 feet must be moved using specialized equipment, due to the combination of weight and fragility. The larger the plant, the more complex the move, and the greater the cost. If you think you are interested in possibly purchasing a saguaro cactus of any size, please contact General Manager Jan Emming at janemming @ dfranch.com. When you write, let us know your situation, what size you are most interested in, how many you are considering getting, and where you live (including zip code) so that we can estimate a shipping cost to you. Payments can be made via cash, personal check, money order, or PayPal. Payment arrangements will be made after finalization via email - there is no order form on this website due to the highly variable and individually specific nature of what we sell, which requires individualized attention. Please contact Jan Emming or by phone at (928) 766-2597. 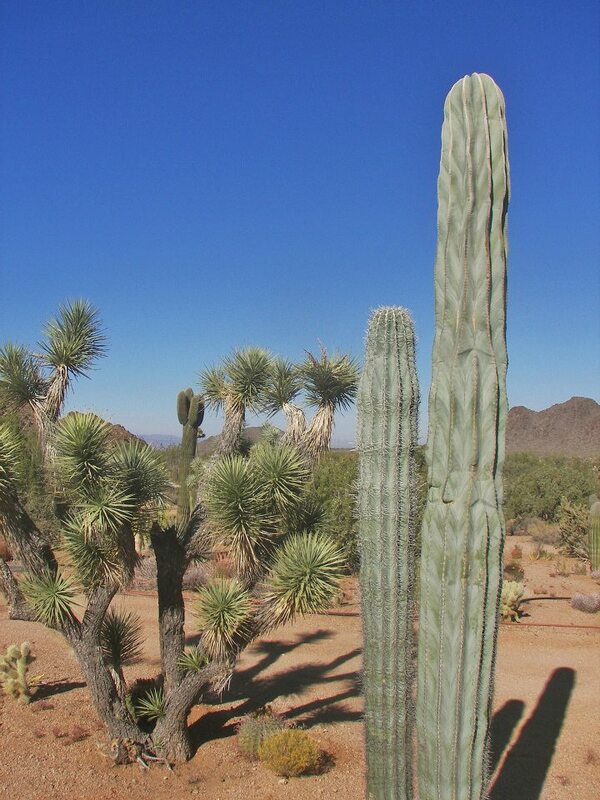 In addition to the very popular and well-known saguaro cactus, we carry a number of species of large, column-forming and/or branched cactus with a single trunk, most of which are hardy to between 22F and 28F, with a couple of them going even lower than this into the 17F range for brief spells. We want to offer them for sale but don't see as many requests for them, and as such we don't list precise sizes and prices because there is a lot of variability to them and we sometimes sell out for a few months before we can obtain more. Just ask. In general, however, the plants range in size from 1 gallon pots up to 15 gallon pots, and can generally be shipped via FedEx if they are under 5 feet tall or 70 lbs in weight, which most are.